I have reviewed one other ATO magazine (http://www.awargamersneedfulthings.co.uk/2018/05/against-odds-magazine-issue-42-with.html). Once again the ATO magazine is a real stunner. The articles are all well done and very interesting. 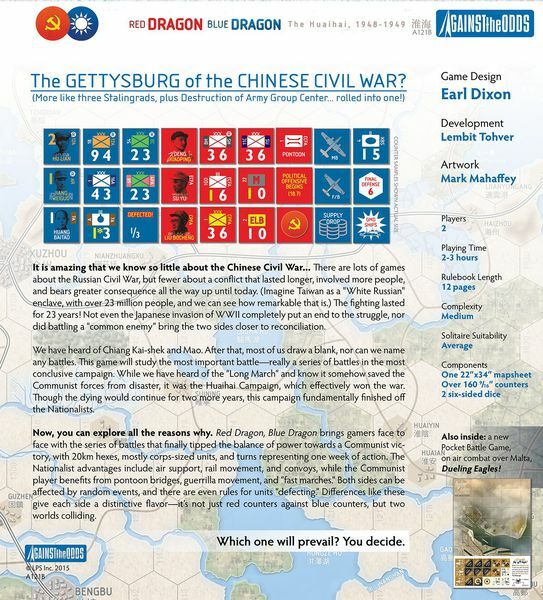 The game in this issue is about the campaign for China during the latest Chinese Civil War in 1948 and 1949. This was the last real showdown between the Nationalists (Kuomintang, GMD) and the Communists (PLA). 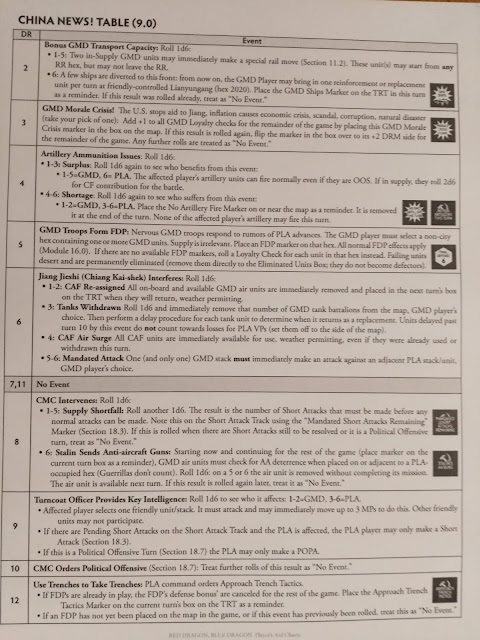 The game rules use GMD and PLA to differentiate. The background history article is fascinating reading. One of the facts I was not aware of is how many American advisors in China were actually more on the side of the Communists than the Nationalists. This did cost them later when they all seem to have been caught up in the McCarthy era anti-communist purges after returning to the US. From a purely armaments point of view, the Nationalists should have won. Unfortunately for them, the Communists were able to successfully fight for the hearts and minds of the Chinese people. On Guards: The "China Hands"
As you can see the articles are varied, and they are also well interspersed with pictures and maps. The game is an operational one about the Battle of Huai-Hai. This was a fight for the center of China. The Communists had pretty much overrun the North, and the Nationalists had the South. The Communist party had decided that they were ready to capture the strategic city of Xuzhou. The Nationalists have tanks and air support. The Communists are armed with a jamboree of weapons from the Nationalists themselves to captured Japanese ones. Make no mistake, in these battles the Nationalists are the underdog. The map is scaled to twenty kilometers per hex. The game is played in one week turns. The units are mostly Nationalist Corps and Communist Columns. These are anywhere from 15,00-40,00 men. The rules call the PLA Columns Corps for ease. Artillery units represent 36-54 pieces. 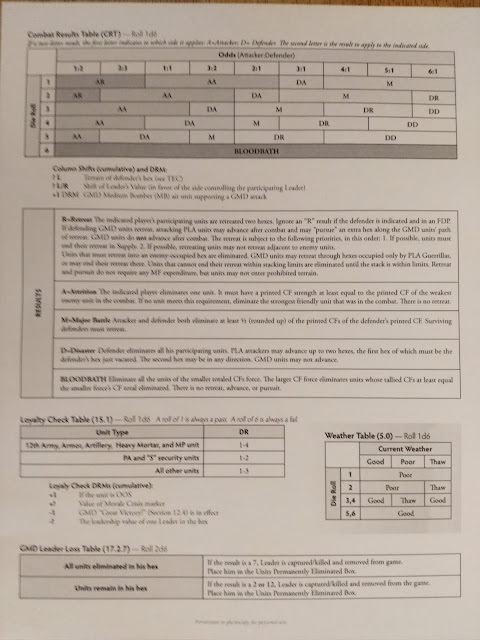 Armor Battalions are 18-30 tanks. The GMD air units equal roughly 40 aircraft. 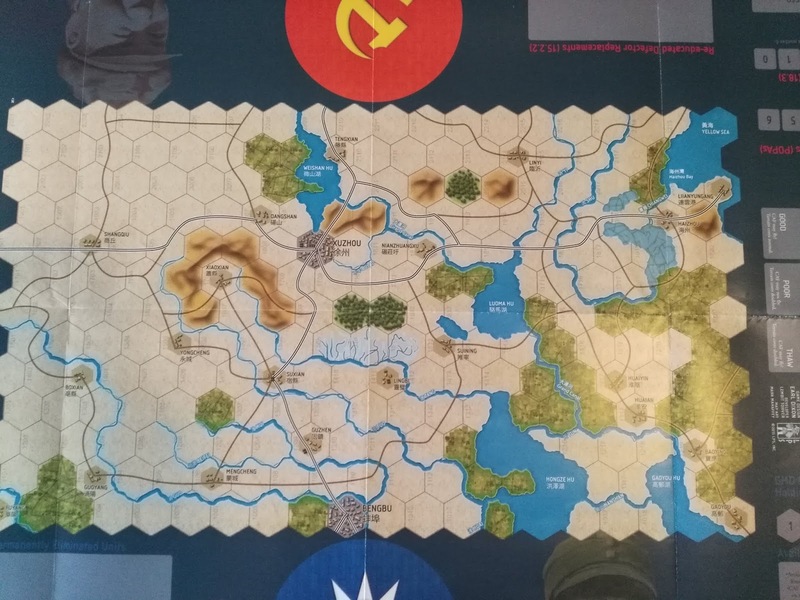 The actual map portion is small, but it is well done. The small map size allows all of the extras, like the turn track etc, to be on it. The counters are your normal magazine sized counters, but they are well done and easy to read. Nationalist defection is one of the pivotal parts of the game. The Battle for Xuzhou has been described as the Gettysburg of the Chinese Civil War. The soldiers on both sides of the battle came to about a million men. Oddly enough, considering Korea and Vietnam, the U.S. refused to get involved. So let us look at the game play. One of the most interesting and innovative rules had to do with one of the events that can happen when checking the China News Table. This is the PLA Political Offensive. This Political Offensive lasts for three turns. During these turns the PLA can move but not attack. They are allowed to do POPAs (Political Offensive Propaganda Attacks) against the GMD units. These propaganda attacks can cause the GMD units to defect. This propaganda offensive actually happened historically. It was caused by a tremendous amount of casualties suffered by the PLA, and the fact that the Communist hierarchy (Mao) wanted to win an ideological war. Historically this was followed by the US shutting off aid to the GMD. This was really the last nail in the GMD coffin. The flight to Taiwan was the next step for the GMD after the battle of Huai Hai. There is also an explanation of the seeming change in the names of Chinese cities and areas in the last fifty years. The difference is that the older names we were used to reading were from the Wade-Giles system of translation. The newer Pinyin system is the reason the names changed. So Peking was Wade-Giles and Beijing is Pinyin. 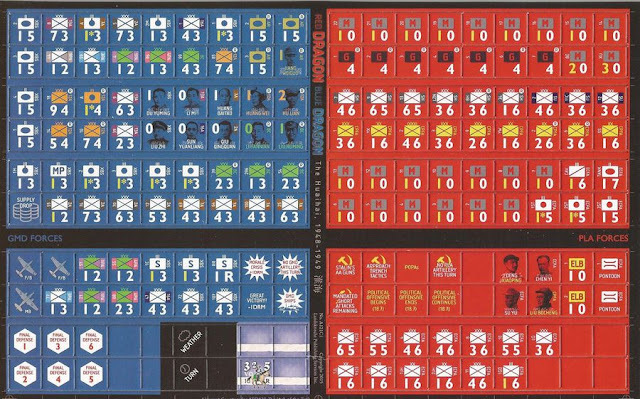 The author of the game's background piece shows both to help the reader. In all ATO games there is a side that has their back up against the wall. As mentioned, in this game it is the Nationalist/GMD. Historically the amount of troops that defected from the GMD was large. So playing as the GMD, you have to be ready for anything. It is a tough side to play. The victory conditions are fortunately skewed a bit to help you. The PLA must get a sudden death victory or annihilate the GMD forces. A sudden death victory is if the PLA occupy Xuzhou with a supplied PLA unit on turns one through three. Do not get me wrong, the game does not all go the PLA's way. When the Political Offensive shows up, the PLA player is pretty much hamstrung. 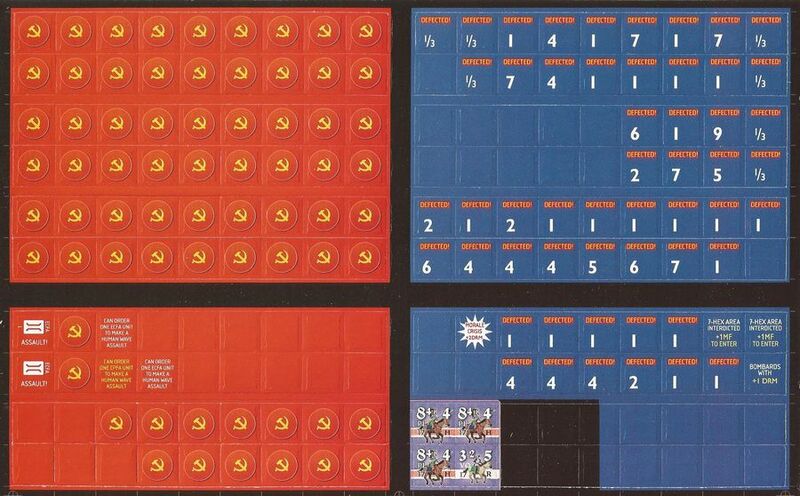 As the designer puts it "The Political Offensive can really wreck what seemed to be a victorious PLA campaign. The PLA player needs to be ready for it; it will happen. This means making hay while the sun shines; do not think that you can afford to take a 'slack turn' just because you are ahead (Unless the Political Offensive has already occurred!)" All in all, a great issue, and a pretty good game about a very unknown (to the West) campaign. The background history of the campaign is stellar.